If you need to increase the absorbency of a brief (tab-style diaper) or protective underwear (pull-on-style diaper), it's booster pads to the rescue! 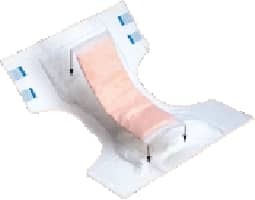 Booster pads are designed to fill to capacity; and then to allow excess liquid to flow into the brief or protective underwear - right into the absorbent (or "acquisition") area. Booster pads are available in different sizes and shapes. Ask us for assistance with selection, or for samples. Remember: booster pads do not have a waterproof barrier, so they are not appropriate for use in regular underwear.